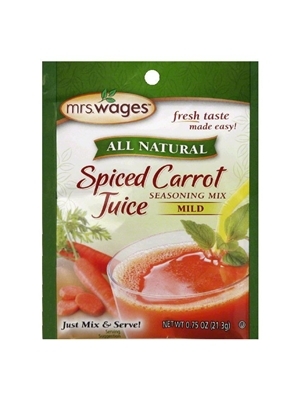 Mrs. Wages Spiced Carrot Juice Seasoning Mix creates a delicious spiced carrot juice using our all natural, spiced seasoning mix. Just mix and serve. Each pack makes 1 quart of juice. Process carrots through juice. If needed, add additional water to uield 1 quart of juice. Whisk in seasoning mix. Keep refrigerated up to 1 week. Sugar, Spice, Lemon Powder (contains Corn Syrup Solids, Lemon Juice, Lemon Oil), Ascorbic Acid.